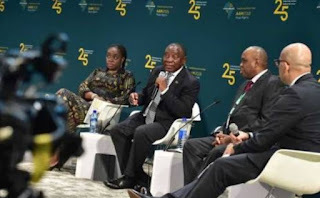 President Cyril Ramaphosa has given an update on his visit to Abuja saying South Africa plans to deepen relations with Nigeria. Ramaphosa is in the West African country at a conference of the African Export-Import Bank. Ramaphosa has lauded Nigeria for playing an important role in helping South Africa fight apartheid. Ramaphosa has invited Nigerian President Muhammadu Buhari for a state visit to South Africa. He says the killing of foreign nationals should be regarded as criminality. Nigerian president says he must think carefully before signing an accord to allow for free trade across the continent.